There are few things worse than the thought of getting out of a warm shower and feeling the cold air hit your body. This is why so many of us will stay in for as long as we can, prolonging this horrible effect. If only you could improve the experience by heating up your towels. Instead of getting out and feeling cold, you can now wrap yourself up in a warm towel and enjoy a blissful feeling. The problem with this is that heating towels isn’t always easy. You could put it on a radiator, but this means half of it hangs down the back side – which is ridden with dust, cobwebs, and grime. Thankfully, towel warmers are the perfect solution to this. You can rest your towels on a clean surface right next to the shower, and they’ll be nice and toasty by the time you come out. Plus, you can even hang clothes over these to dry, or make your hand towels nice and hot as well. As you can imagine, there are plenty of towel heaters on the market that all claim to be the best. You tend to have two main options; wall mounted ones or freestanding ones. Below, you will see a host of towel warmer reviews that will help you figure out which one is the best for you. Then, you can make a more informed purchase and enjoy warm towels forever! This offering from HEATGENE is a wall-mounted towel heater that can be plugged into a nearby socket. It can reach up to 149 degrees Fahrenheit and is perfect for the modern bathroom. One of the most immediate features of this towel warmer is the design. It’s incredibly simple and elegant, with lovely stainless steel construction and mirrored finish. As a result, it’s almost a decorative piece along with a towel warmer – meaning you get more bang for your buck! It’s a DIY unit as well, with the whole construction being very lightweight. This makes it very easy to assemble all by yourself, and there’s absolutely no need to hire an electrician or bathroom contractor to install it. The fact it fits on your wall also means it saves a great deal of space in the bathroom! What’s more, it heats up very quickly, so you don’t need to worry about turning it on an hour before your shower and using up loads of electricity. All things considered, this is a convenient and compact little towel warmer. The high-quality mirrored design, combined with the practicality, makes it ideal for small bathrooms in particular. There is one thing to be cautious of; make sure you don’t install this product too high on your wall as it can put the on/off switch out of reach! 【CURVED BAR DESIGN】: The HEATGENE towel warmer's curved design is convenient for hanging towel and uses 8 bars to evenly distribute heat, warming up to 2 large towels or bathrobes. The color will fit any decor. You can put multiple items on it at once, but not overlapping,making it ideal for warming up towels. Your family will get cozy towels whenever they step out of the shower. 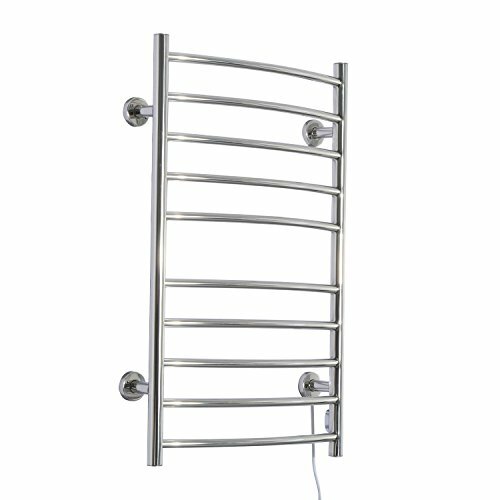 The Radiant Towel Warmer is another wall-mounted option that comes in a pleasant polished stainless steel finish. It’s the type of thing you’d probably see in most high-end spas, and it does an excellent job of adding to the interior appeal of your bathroom. The curved bars mean the towels drape over the heated crossbars with ease – and it keeps them from sliding down onto the floor while you shower. Again, it can reach up to 149F, which means you need to be careful when it’s on as it can burn you if you touch the metal parts. But, this means that your towels will be heated up incredibly well! Once more, the curved crossbar design lets you cover the whole towel on both sides, which leads to a more even warmth that will feel very toasty! Now, you can use the on/off switch to decide when you want the towel heater to turn on, but you can also get an optional plug-in or wall-mounted timer as well. This can be handy if you shower at the same time every day, so you ensure that the heater is always ready to go when you need it. 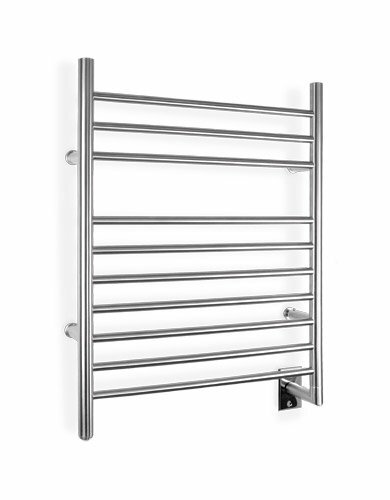 If you’re looking for a stylish and large towel warmer that saves space by being mounted on the wall, then this could be it. The only downside for some is that it’s hardwired, which means you might need an electrician to help install it. HomCom comes in with the first freestanding towel warmer on this list. It has a very simple design that’s hard to critique; there are plenty of horizontal bars that allow you to fold over at least two large bath towels at the same time. So, for any women that need the old dual towel set up for their body/hair, then you can enjoy them both warmed up! The freestanding design can be beneficial as well. If you have a large bathroom, then it won’t really take up much space at all. Even if your bathroom is small, you can move it to another room when you’re not using it. This also means you could potentially take it into a larger area and use it to dry clothes as well. What’s more, you only need four screws to assemble it, which makes it so easy for anyone to do. Plus, the on/off switch comes with a protective casing to prevent moisture from getting inside and causing problems, which is a big positive. It’s not as hot as some other towel heaters, and it can take a while to heat up. But, provided you turn it on in advance of your shower, it shouldn’t be a problem. 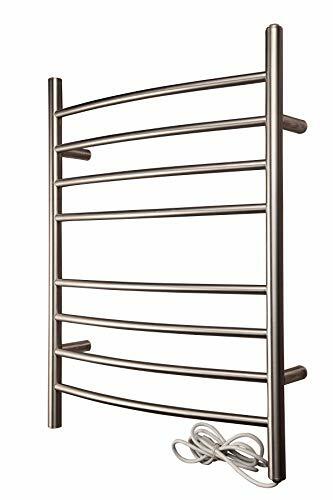 Having said that, it’s considerably cheaper than some of the hotter bath towel warmers on the market, so you’re always going to compromise a little bit of quality to spend less. 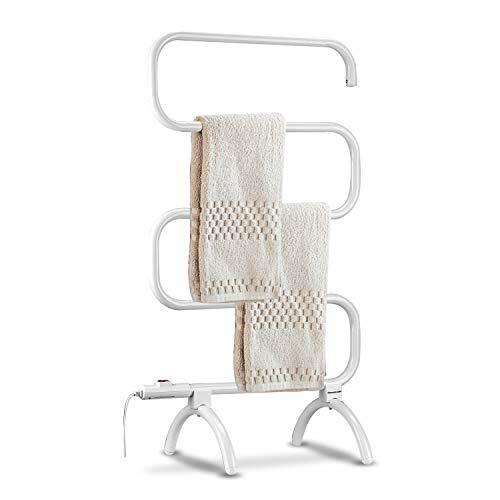 FREESTANDING DESIGN: This contemporary, freestanding towel warmer keeps your towels & robes dry, warm, and comfy once you step out from bath or shower. 6 WARMING BARS: Six straight electric warming bars offer quick, evenly distributed, and efficient heat for warmth. QUICK AND EASY: Simply press the switch and the warmer will reach optimum temperature in ten minutes or less. SAFE OPERATION: It comes with a safe cover on/off switch with a light indicator to show you that the warmer is on and heating up. CONVENIENT: Ideal for quickly and easily drying of towels and robes indoors in spaces such as bathrooms, laundry rooms, dorm rooms, and more. Instantly, the WarmlyYours 10-Bar towel warmer has the advantage of being spacious. With ten bars, it allows you to warm up many towels all at once. As an example, you could warm your bath towel, hand towel, and possibly even your bathrobe at the same time. So, you can stay warm for much longer after getting out of the shower! With a brushed metal finish, you’ve got something that has a contemporary design to suit the modern bathroom. It’s wall-mounted as well, which is advantageous when you consider the design is somewhat larger than other options on this list. By attaching it to a wall, it means you aren’t taking up any floor space and can keep your bathroom as spacious as it always was. There’s definitely a luxurious feel to things, and you’ll notice how robust the towel heater is when you get it. This is great as it means the rack is less likely to break after a few uses – you even get a 2-year manufacturers warranty with this product, which is a helpful bonus. The plug-in design makes it incredibly easy to install without the need of any professional help. People can be very cautious when installing towel heaters in their bathroom because of the wires and moisture in the air. But, all you have to do is mount it on the wall and plug it into a nearby socket; simple! When it comes to the heat, you can get a maximum of 140F from this, which doesn’t make it one of the hottest options here. However, it will still do the job, you just might not get the extreme warmth that others provide. 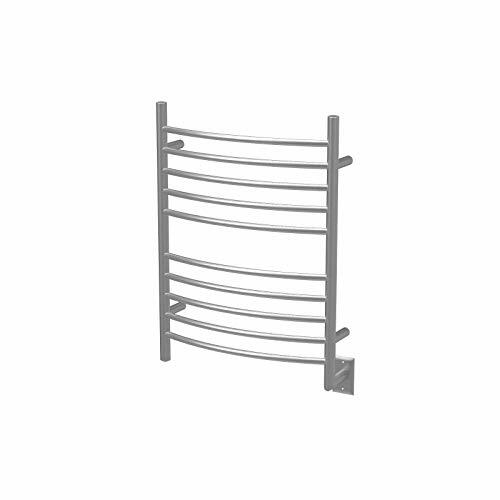 One thing springs to mind when looking at this bath towel warmer; versatility. In fact, calling it a bath towel warmer doesn’t really do it justice. The unique design of this product means it can be used for drying clothes as well as heating up robes or towels. Speaking of the design, it’s one of the few products where you can choose to have it wall-mounted or freestanding. So, if you prefer a freestanding towel warmer that you can move from room to room, then keep it like that. Or, if you’d like to save space, then take advantage of the wall mounted capabilities. The quirky design of the bars means you can hang loads of things on it at any given time. But, you don’t always get an even heat through the towels – it depends on how many you’re handing at once. The heater reaches a maximum temperature of 114F in under 30 minutes, so make sure you turn it on a few moments before you step in the shower. As far as towel heaters go, it’s not the most powerful. But, it does offer more variety than others on this list so it can be highly beneficial to some people. All of these towel warmers have their own benefits and key features. When you’re making a purchase, make sure you think about the main features that benefit you the most. If you have limited space in your bathroom, then it makes sense to opt for wall-mounted products as they’re out of the way. If you don’t want to call in an electrician to help install your heater, then it pays to only go for plug-in options over hardwired ones. Or, if you’d like something that you can use elsewhere in the home – to maybe dry clothes or kitchen towels – then a freestanding towel heater might work best for you. Weigh up the options, think about your budget, and you’ll soon find a bath towel warmer that keeps you nice and snug whenever you step out of the shower!